Sangajayana is worshiped by Thai people as a great fortune monk. His name emerged from a synthesis of Sang+Gajayana. 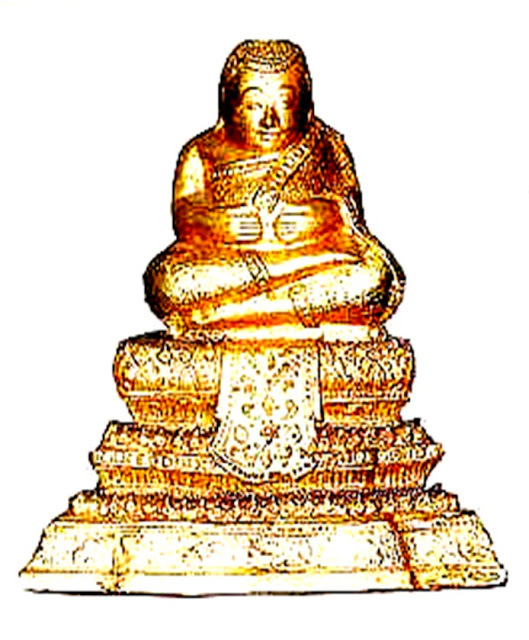 Sang means conch while Gajayana was the name of an important disciple of Lord Buddha. 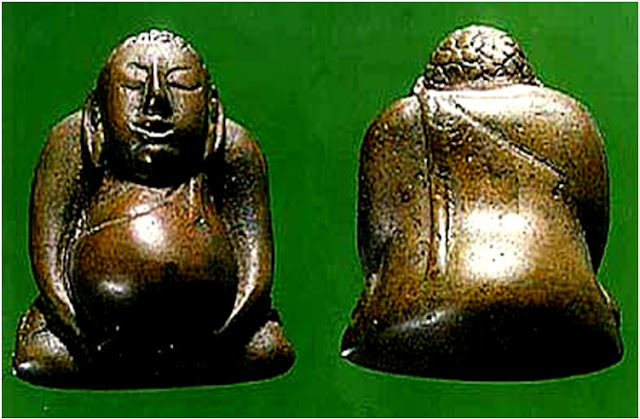 An old bronze Sangajayana with big round potbelly. 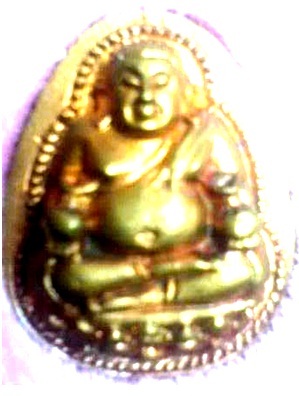 Buddhistic legend says Gajayana's physical body was so similar to Lord Buddha that many people frequently misidentified him as the Lord. Gajayana felt uncomfortable with that wrong identification. So he magically transfromed himself to be an ugly monk with a big potbelly, wishing to be looked different from the Lord. An old wood-carving Sangajayana , Wat Bang Nam Won Temple. He was applauded by people as a monk of humble consciousness with his high respect to the Lord. Then came the great fortune to Gajayana !! People gathered to make merit by offering him a great deal of food and many other needed things. Such the occurrence was called in Thai language "Mahalapa" or the unexpected great fortune. Left : Bronze Sangajayana of Ayuthaya period brushed with black lacquer and gold leafs . Right: An old holy-powder votive tablet of Sangajayana,Wat Ngern Klong Toey. 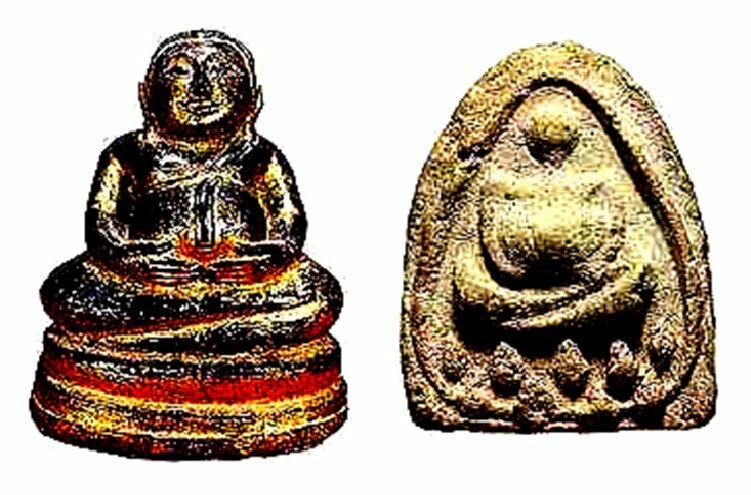 In the early of Ratanakosin Period about 170-180 years ago, a piece of ancient bronze "Sang" and a bronze figure of "Gajayana" were found in a monastery in Bangkok.The monastery was later called "Sangajayana" after the two good omen objects were found.The monastery and its name still exists nowadays. Though the name "Sangajayana" was emerged from the two specific words,the name has later been practically called to any of big-potbelly monk figures. In Thai belief the big potbelly implies a depot for the coming fortune.The gilded bronze Sangajayana seen on the left is the early Ratanakosin period art piece. Old antique Sangajayanas were made varied in sizes, the large sizes of 5 to 9 inchs height for house altar were normally made from bronze.The smaller sizes were made from various materials as amulets for good fortune. 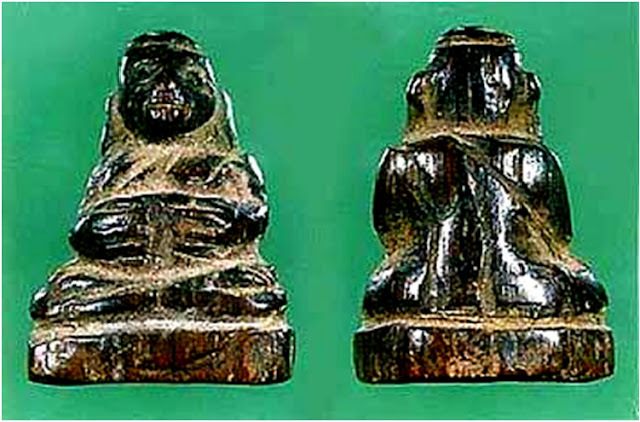 Some guru monks carved them with ivory tusk.The votive-tablet forms were also made from holy-powder plaster, both white and black colors.